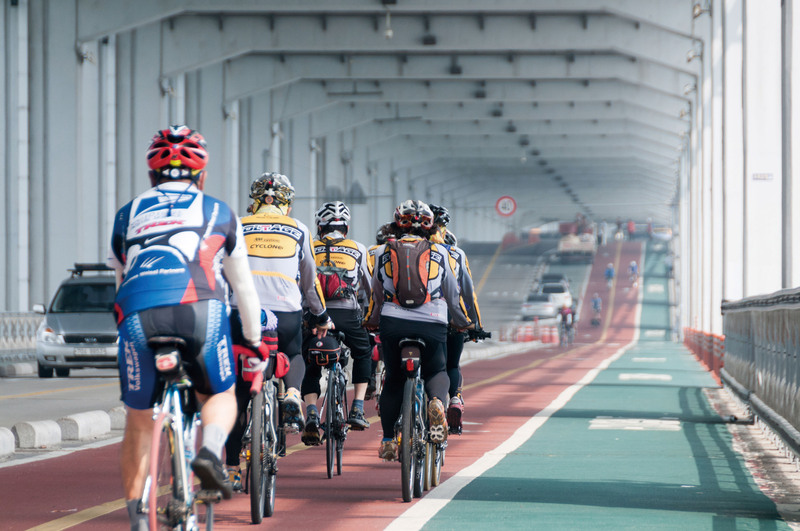 With 18 bike-friendly bridges, there are many ways to ride the Hangang. You can do a one-way trip out and back on one side, or pick two bridges and ride a loop connecting them. A central orientation point for most bike activity on the Hangang is Banpo Bridge. While most bridges are accessed by elevator or stairs from the path, the Banpo has two levels, with a path connecting both sides on the lower level. Banpo Hangang Park, on the south side of the river, is a great place to take a break. Heading west, the path passes by Ichon Park, with great views of the Yeouido skyline, and about 3 km further, Mangwon Park is a great rest stop. Right at the base of Seongsan Bridge, the park has several convenience stores, a large grassy lawn, bike and boat rentals, wakeboarding and a stage with occasional live music in the afternoons. Just past Seongsan Bridge is Hongjecheon Stream, one of the many waterways feeding the Hangang from the mountains to the north. From here, there’s a nice bike path leading 8 km north to Hongje-dong, right at the foot of Mt. Bukhansan. This is a scenic ride, with many great views of the mountains on the way. Back to the Hangang, continuing west past Hongjecheon, Nanji Hangang Park has a great grassy lawn and tons of amenities. If you want get the quads burning a bit, spin up to the top of Haneul Park, a pair of flat-topped hills right next to Nanji. The sunset views from here are spectacular. Further west, the path meanders through scenic marshland areas, and eventually ends about 7.5 km past Hongjecheon. The bike path on the north side of the river is less crowded and safer. This becomes even more so as you head west past Mapo-gu. The path on the south side of the river is more crowded, especially on weekends and west of Banpo Bridge. East of Banpo and past Olympic Park, the route is much nicer and less crowded as you continue out toward Yangpyeong. No daylight? No problem! Most of the main bike paths are well lit within city limits and the early evening is when the Hangang really starts hopping. People head down in droves after work to bike, walk rollerblade, run, drink, sing, camp and eat until the wee hours. Just but be sure to have a bike light for safety and ride defensively. Any social ride on the Han usually includes a beer stop or two at the numerous convenience stores right next to the path. Grab a snack, grab a table with some friends and sip a cold beer as you watch life go by. Spend an evening in the many parks along the way and order some fried chicken or pizza delivery. A bread and butter loop for many cyclists in Seoul, this loop connects bike paths on the Hangang, Yangjae, Hagui and Anyang Rivers. Aside from a short segment on a road in Anyang that joins the Yangjae and Hagui Rivers, this is exclusively on river bike paths, and mostly flat. It’s called the “heart course” because of its heart-like shape on map. The ride offers safe riding and nice views of Mt. Gwanaksan as it wraps around the base. This loop is long but rewarding, and can be ridden in either direction. 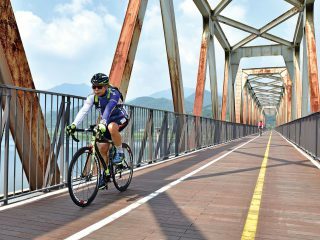 Ride from Seoul, or take the Gyeongui-Jungang subway out to Paldang Station, a great jumping-off point for a number of beautiful rides in the area. The loop combines river bike paths, small city streets and a very cool stretch built on the abandoned Gyeongchun railway. Naver Maps has a well-marked version of this route on their bicycle overlay, so use your smart phone to help navigate. Heading west on the Hangang River from Paldang Station, the route turns north along Wangsukcheon River, then heads east toward Namyangju, passing through several abandoned railway tunnels providing brief, refreshing blasts of cool air on hot days. The path turns south along the Bukhangang River, where you can grab a tasty lunch at the many restaurants in the area. Don’t miss the railroad bike bridge at Yangsuri; it has great views and the park below the bridge is a good place for a rest stop. People who ride for fitness know that you really can’t get in proper shape without some hill climbing. While the best hill climbs are out east in Gangwon-do Province, Seoulites who want to add a little pain to their cycling workout ride Mt. Namsan and the Bugak Skyway. Either can be ridden separately, but this ride combines both inclines into a single nifty loop with some river path riding. If you ride the loop, do it clockwise because the road up Mt. Namsan is one-way. Take advantage of your time at the top of Mts. Namsan and Bugak to take it all in: Both offer great views of the skyline, and Mt. Bugaksan offers fantastic views of Mt. Bukhansan. The Bugak Skyway route passes through the streets of Samcheong-dong, the heart of Korean traditional culture in Seoul. This is easily the most beautiful ride along the Hangang River system, a relaxing cruise along beautiful waterways against a dramatic green mountain backdrop. At 138 km long, fit riders can do this ride in one day, but it also makes a nice two-day ride with an overnight stop midway. The ride is well marked and mostly on bike paths, with a few segments on streets with bike lanes. This route is also included on the Naver Maps bicycle overlay, so your smart phone is once again a must-have for navigation. Don’t miss a pit stop at Jaraseom Island near Gapyeong with great views of the surrounding mountains. 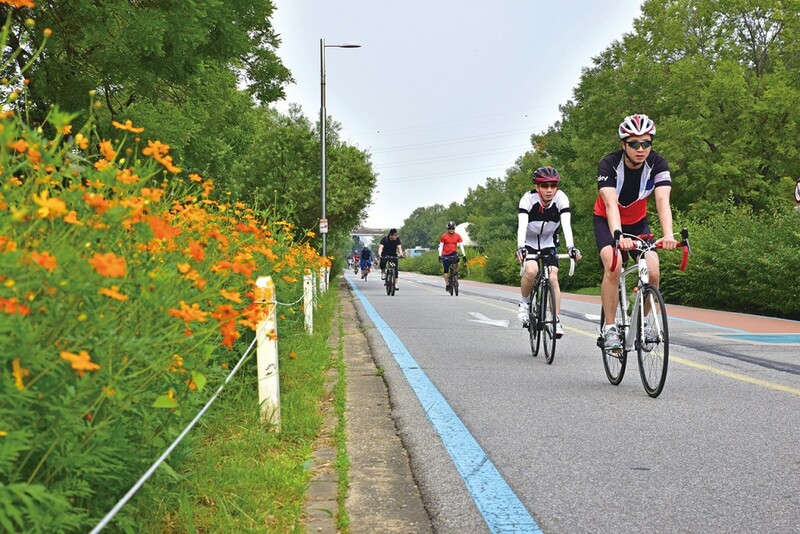 There are two routes into Chuncheon: Follow the marked bike paths east and approach the town from the south, or stay on the west side of the path and follow it north clockwise and approach the city from the north. 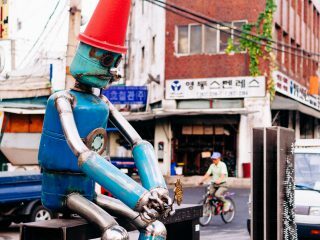 The latter allows you to visit the Animation and Robot Museum, exhibiting the origin, birth and development of animation in Korea and around the world.